Indoor cannabis growers are sure to enjoy and appreciate the outstanding quality, features, and price of this amazing grow light. The Phlizon Newest 1200w Plant Grow Light is portable,lightweight, affordable, and is a very effective light for a small indoor grow. The Full Spectrum Double switches allow for every stage of plant growth, making growing cannabis easier for you. 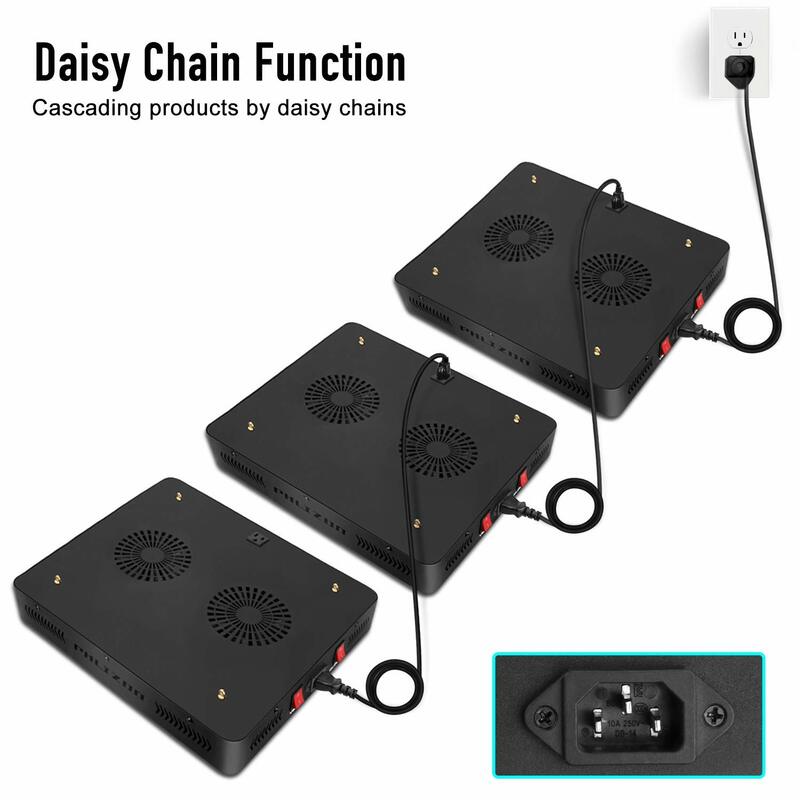 Daisy- Chain capability allows for adding extra lights to expand your growing area. Let’s take a closer look to see why we highly recommend this product for your growing needs. EXTREMELY HIGH POWER– Adopt Dual-Chip(10W) LEDs which has highest PAR/LUMEN output.Double chips 10W LEDs is much brighter and more efficient than traditional 3W and 5W LEDs.The lights will provide the largest source of light to ensure your plants grow quickly and healthy. Includes universal IR, UV Blue &Red; & White Light for vegetation and flowering. The expensive IR UV led promote plants to defense mechanisms, blue and red led is essential light for plant growth. Bloom Switch has White and Red lights specifically designed for the flowering stage. UNIQUE DESIGN- No Light Reflector = No danger. Most lights have reflectors which can melt at temperatures above 80 degrees. Because of the unique design of the Phlizon Newest 1200w Plant Grow Light, No reflectors are required,making this unit much safer to operate. compared to other units. FCC Certified– manufactured with safe standardized production methods. 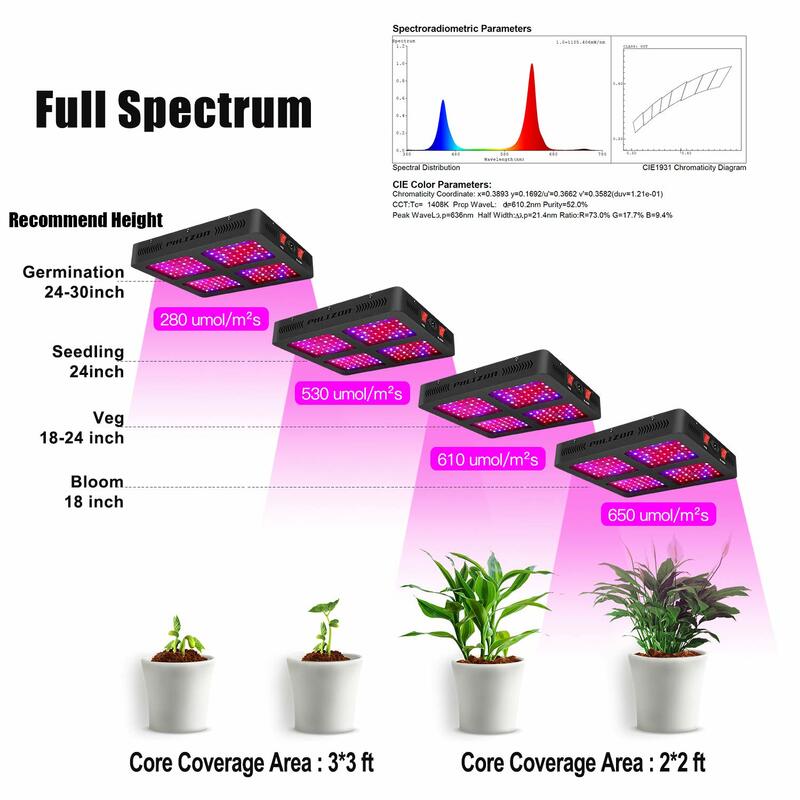 The coverage of this LED grow light is 4×4 feet at its perfect height of 24’, which is ideal for the vegetation stage. Reducing the light height to 18″ for flowering is recommended,covering an area 2.5 x 2.5 feet, which may require an additional light for a 4 x 4 grow tent for maximum results. Thankfully the Phlizon Newest 1200w Plant Grow Light has the Daisy-Chain Capability, meaning multiple lights can be added to expand the coverage of your grow space while using only a single power outlet plug. The Philzon Newest 1200w LED Plant Grow Light gives an entire 12-band spectrum of light including the infrared and UV, which is great for your indoor growing needs. This light is perfect for any grow space of 2.5 x 2.5 feet or larger, bearing in mind that additional lights may be required to achieve maximum results. The Phlizon Newest 1200w Plant Grow Light comes with a 2 year warranty and a 30 day money back guarantee. Based on over 400 Amazon reviews, the customer service is impeccable, with most customers absolutely satisfied with the professional level of customer service offered. There are a lot more Pros than Cons to the Phlizon Newest 1200w Plant Grow Light, making this light a great choice for your growing needs. Based on over 400 reviews on Amazon, the 2 biggest complaints were the packaging, which needs improving, & the fans are a little noisier than expected, but should’t be a problem at all for most people. Overall this is a superb product at a very affordable price, and comes highly recommended especially in this particular price range. Because of the many positive features of The Phlizon Newest 1200w Plant Grow Light is a great choice for your indoor growing needs. The Final Thoughts: This Is A Great Light! After thoroughly examining the Phlizon Newest 1200w Plant Grow Light, it comes as no surprise that this product is by far the best Led grow light in this price range. 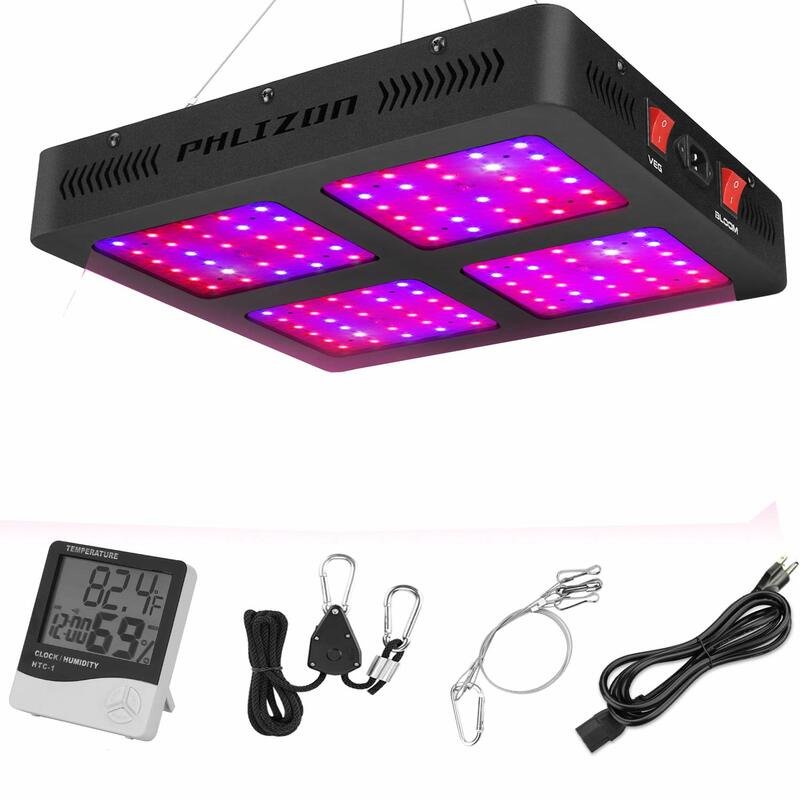 This light has so many great features to offer, it’s no surprise that there are so many positive reviews by customers on Amazon who are absolutely satisfied with the final results of this amazing grow light.The biggest complaints seemed to be poor packaging, and the fans seem a little noisy compared to other lights, but overall almost everyone enjoyed their experience growing with the Phlizon Newest 1200w Plant Grow Light and plan on adding more Phlizon products to their indoor grow. The Phlizon Newest 1200w Plant Grow Light is the Best Led light in price range, and is portable,lightweight, and will save money by consuming less hydro than HPS lights. It has No reflectors which makes it safer to operate, Dual- switches for Veg & Bloom stages, Daisy-Chain capabilities, Adjustable rope and hanger kit. This is a great light for a 4×4 ft grow tent or grow space at the recommended height of 24″ for the vegetative stage, and an area of 2.5 x 2.5 ft at a height of 18″ for best results during the flowering stage of your indoor grow. It is my opinion that a second light should be added to maximize a grow area of 4×4 ft to ensure your plants receive the best quality of available light for best results. But for a smaller area then absolutely one light will for sure serve your purpose with outstanding results. The Phlizon Newest 1200w Plant Grow Light is an awesome product that will produce superior results, and is currently the top selling light in the price range. We give the Phlizon Newest 1200w Plant Grow Light a very high score of 4.5 stars out of 5 stars! This is the best led light in price range, and is an awesome light that comes highly recommended to any indoor grower. ← World’s Best Online Headshop!